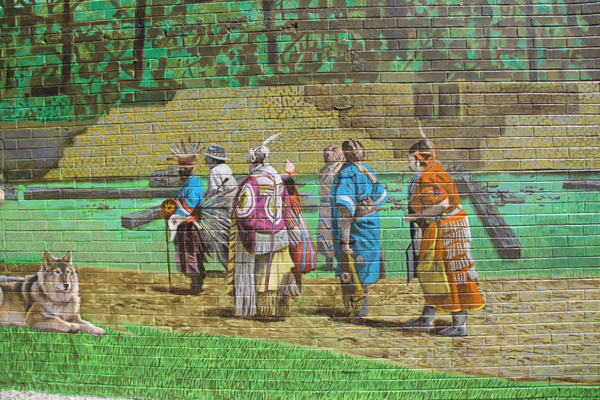 The mural depicts a symbolic departure of Iroquoians from the Rouge in the late 1600s. After the last ice age retreated, the first peoples to inhabit the area of the Rouge River watershed were aboriginals. Their time period is referred to as the Paleo-Indian Period, beginning approximately 10,000 years ago and lasting 3,000 years. These nomadic people were hunters and gatherers, living off the land and following the migratory travels of the caribou and other large prey. The next timeline in our history was called the Archaic Period. This time period lasted from approximately 7,000 BC to 1,000 BC. Fish weirs appeared at “The Narrows” between Lake Simcoe and Lake Couchiching that have been carbon-dated to over 4,000 years old. 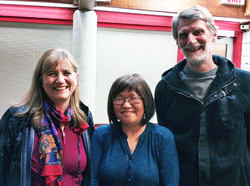 Three Archaic sites were found in the Highland Creek watershed. The numerous stone, flint tools and weapons show a more refined technology. Specialized tools such as stone axes and spear points have been found along with native copper from Lake Superior. Their hunting technique was quite different than the Paleo period. They would gather at points along the shoreline and rivers when the fish were running and the wild fowl was abundant, moving inland during the winter months to hunt game and collect wild berries. The Initial Woodland Period was a relatively shorter period from 1,000 BC, lasting approximately 1,700 years. It was during this period that clay pots started to be used. This allowed for storing foodstuffs over longer periods of time or during times of drought. Newer weapons such as the bow and arrow allowed for greater success in hunting and this in turn allowed for larger settlements to be created. These more permanent villages also allowed for agriculture to take place. This provided a more sustainable way of life. The Late Woodland Period began around 700 AD and lasted until the mid-1600s. The aboriginal population increased dramatically during this time period. Villages of longhouses provided better protection from the elements. Longhouses varied in length from 10 to 50 metres, with many campfires inside. Typically, two families would share each campfire. The longhouses were constructed of slender poles that were buried into the ground along each width of the longhouse. The poles were then bent towards each other and laced together. The interior had elevated surfaces on each side made with poles and saplings that were used as sleeping and storage areas. The entire outer surface was covered with tree bark and the two ends were enclosed with a passageway for entering and leaving the longhouse. Permanent slits were constructed in the roof as a way to clear the smoke from the fires. Two such villages have been discovered in Scarborough. One village, the Thomson site, was located on the west side of Brimley Rd., south of Ellesmere Ave. Excavation revealed many pottery and food items that had been charred and preserved by the fires. At this time, burial practices had changed somewhat. Ossuaries came into use, which were large communal burying pits. Every 10 to 12 years, word would be sent out to surrounding and distant groups to prepare for “The Feast of the Dead” ceremonies that were held in many parts of Ontario. In the early 1600s, Father Jean de Brebeuf, a Jesuit priest, witnessed such a ceremony near Midland. People would collect their dead from the last number of years, clean and wrap the bones in animal furs and travel to the appointed sites at the arranged time. This was a very solemn event as the aboriginals had the greatest respect for their dead. After a pit four or five metres in diameter and two metres deep had been dug, poles would be extended out over it. The bones of the deceased, wrapped in the animal skins, would be secured to the ends of the poles. After a few days of celebration, at a set time, all of the bundles would be lowered into the pit at once and male members of the host tribe would enter the pits and cover the remains with soil at great speed. This would bring to an end the The Feast of the Dead. Two such pits dating from 1250 AD have been located in Scarborough at Taber Hill on the east side of Bellamy Rd., just north of Lawrence Ave. On Aug. 17, 1956, during construction for a new housing subdivision, a pit was accidentally opened. One pit contained the skeletal remains of at least 177 individuals and the second larger pit contained remains of at least 472 individuals. At a later date, the Huron nation began to relocate to the area between Lake Simcoe and the tip of the Bruce Peninsula. The fur trade had decimated the beaver population in the area of northern New York State. Raiding parties of Iroquois had been travelling into the former Huron hunting ground south of Lake Simcoe to Lake Ontario. Ferocious attacks against the Hurons were beginning to take their toll. In a 10-year period from 1639 until 1649, the Huron nation had gone from 40,000 individuals down to approximately 300 souls, as a result of disease brought by the Europeans and the Iroquois wars. From the early 1600s, the area we know as Scarborough was a virtual no-man’s land. In the late 1660s, the Seneca villages of Ganatsekwyagon, located at the mouth of the Rouge River, and Teiaiagon, located at the mouth of the Humber River, had established themselves at the foot of the two Toronto Carrying-Places and were in command of traffic to the northern areas of Lake Simcoe and Georgian Bay. French missionaries M. de Fenelon and M. d’Urfe spent the winter of 1669 and 1670 in the Seneca village of Ganatsekwyagon. This is the first recorded residence of white men in the neighbourhood of Toronto: a fact that is commemorated by the name Frenchman’s Bay just east of the Rouge River. As noted in “A History of Scarboro” by David Boyle in 1896, “A little to the west of the Seneca village (Ganatsekwyagon) was a stream that gave kindly shelter to distressed canoes; and so by Indians of the next century and of a different race it was named Katabokokonk, or the “River of Easy Entrance.” In making its way to the lake, it pierced a hill of tenacious red clay, which sufficiently coloured its waters to justify the old French name, Riviere Rouge. It is still the Rouge and the name is interesting as the sole remaining trace now of this northwest shore of the old Sulpician Missions of Louis the Fourteenth domain.